ESO Supernova Exhibition — When did the Solar System form? When did the Solar System form? The Solar System only formed 9 billion years after the Big Bang. By then, the expansion of the Universe had started to accelerate again as a result of a mysterious form of energy called dark energy. 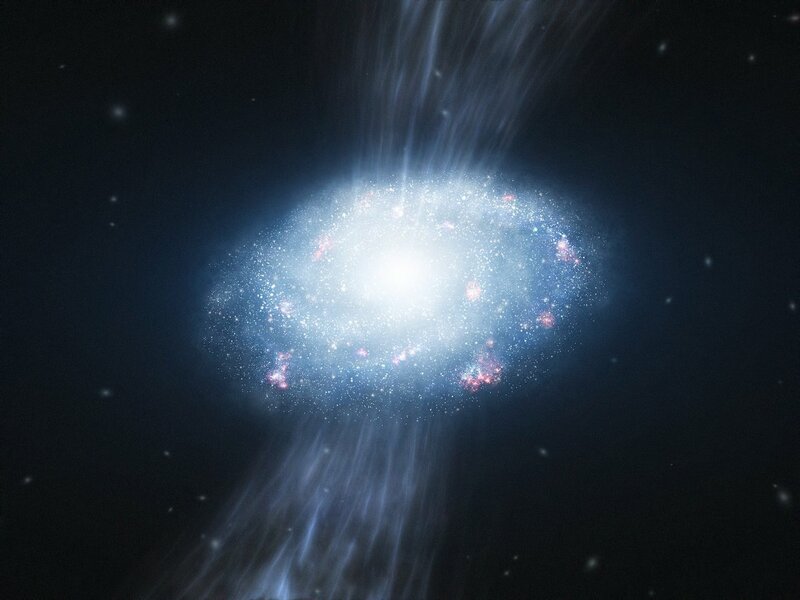 Growing galaxy: Despite the expansion of the Universe, matter was able to clump together into galaxies, which kept growing by drawing in additional gas from their surroundings (artist’s impression). Opposing forces: While gravity tends to draw matter together into galaxies and galaxy clusters, the mysterious dark energy in empty space pushes galaxies away from each other at an ever-increasing rate. For billions of years after the Big Bang, the expansion of empty space slowed down as a result of the gravity of all the matter in the Universe – the force of gravity worked against the force of the expansion. However, observations of distant supernovae have revealed that the expansion eventually started to accelerate again. Apparently, empty space has always contained a mysterious form of energy – dark energy – which now dominates the large-scale effect of gravity. Meanwhile, some 9 billion years after the Big Bang, in a remote corner of one of the many billions of galaxies, our own Solar System came into being. Turnover point: After a few billion years, dark energy became more influential than gravity, and the expansion of the Universe started to accelerate. Supernova support: Observations of distant supernovae support the theory that we live in an accelerating Universe. Unfortunately, the true nature of dark energy remains a mystery. After the Big Bang, the Universe grew bigger and bigger. Its growth even started to speed up again. The Sun and the Earth were born after only about 9 billion years.